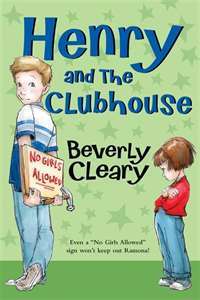 Henry and the Clubhouse is my favorite Henry Huggins book yet. Of course, Henry overlaps with the Ramona series. She’s his pesky little neighbor. And in this book, the two of them certainly clash! ‘Gee, thanks, Dad,” said Henry modestly. He had waited a long time to hear his father say he was proud of him. ‘I’ll admit that when you took on the route and then got mixed up in building a clubhouse, I didn’t think you could handle it, but you’ve done a good job,’ said Mr. Huggins. There you have it. Responsibility, pride in one’s work, friends, family and a kid-pleasing story. Is there any wonder why I love these books? Enjoyed the review. It’s been a while since I’ve read Cleary’s books, but they were a favorite of my daughters. So simple with lovely messages. Thank you for the walk down memory lane. They’re oldies, but goodies. My boys and I read several Cleary books together this fall, and they absolutely begged for the next one each time.